A cloud-based customer relationship management platform (CRM) is a crucial tool for any modern sales stack. As your business grows, so does the number of customers and contacts you have to keep track of – which is where a robust cloud CRM system comes into play. If you haven’t made the switch to a cloud CRM yet (or you haven’t made the leap from spreadsheet to using a CRM at all! ), you could be hindering your sales team and slowing down your business. A cloud CRM, as the name suggests, exists in that intangible place we call the cloud. Although we can’t see where a cloud CRM is stored, we can certainly see and experience the benefits it provides. 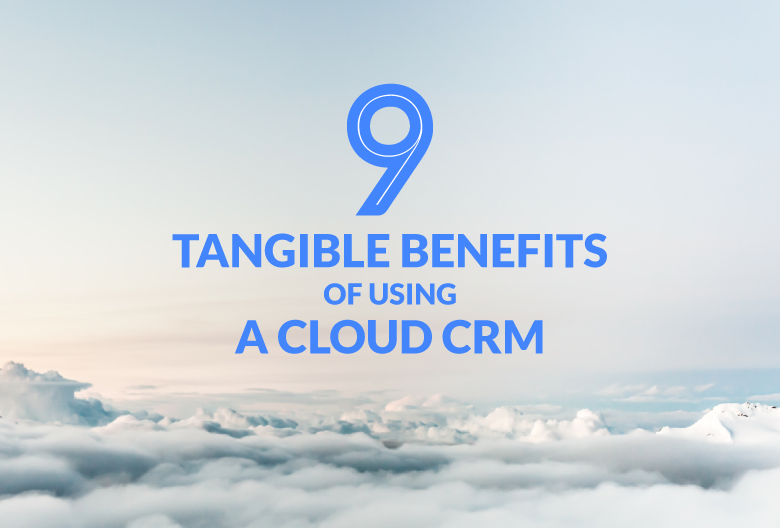 That’s because the positive impact a cloud CRM makes on your business is real, palpable, and substantial. For instance, plenty of sales teams rely on Propeller CRM to streamline their workflow, including cold email outreach, managing their contact list, tracking sales activities and opportunities, as well as optimizing their sales process. Now, let’s explore the reasons why every modern business functions better with the help of a cloud CRM. In order for a startup or small business to successfully adopt any type of new software, it needs to be easy to get started. After all, things are moving quickly and you don’t have extra time or resources to spare. One of the biggest reasons a business might hesitate to try a CRM is the fear that installation will be complicated and the onboarding process will be more trouble than it’s worth. Fortunately, with a cloud CRM, installation is a non-issue. There’s no hardware involved, you don’t have to set up your own server, and there’s zero maintenance required. That means you don’t even need an IT team to handle installations or data migrations – because the CRM provider will take care of it all remotely. As long as you have internet access, getting started with a cloud-based CRM platform is easy. Sales teams love cloud-based software because it’s accessible from anywhere. Most cloud CRMs are mobile-friendly and make it easy to access the information you need about your contacts on-the-go. All you need is a Wi-Fi connection and your login information to connect. Since it’s hosted in the cloud, your customer data is available 24/7 – not just when you’re at the office. Information stored in your CRM is organized and accessible to everyone on your team from anywhere in the world. This means your inside sales team can review the same information as your outside sales reps meeting clients on the road. A cloud CRM is also a lifesaver when you need to make a last-minute sales call or when working remotely. You can quickly check up on a client or get the details you need for an important sales call whether you’re on your phone, tablet, laptop, or borrowing someone else’s device. Not only does a cloud CRM ensure your customer data is always at your fingertips, but it’s simple to use. Onboarding is a different experience for every platform, but Propeller CRM doesn’t involve a steep learning curve. Thanks to our simple onboarding process, you’ll be up and running within minutes. You can upload and sync existing customer data, edit details whenever you want, and customize fields and reports to fit your sales process. Our cloud CRM also allows you to easily send cold email campaigns, generate new leads, keep track of existing customer data and communications, and send follow-up emails. If you do run into trouble, you can simply get in touch with your CRM company’s customer support team to help you figure it out. Small businesses don’t need to invest a bunch of capital to get started with a cloud CRM. Switching to a cloud CRM is a low-risk endeavor with very high reward potential. The services offered can save your sales team time by taking care of data management, so they can focus on selling and bringing in more revenue. Plus, a cloud CRM requires less resources to maintain, so you don’t need to hire a big IT team to manage it. Some cloud CRMs offer a range of subscription types, which means you should keep a close eye on creeping costs as you expand your team and the type of functionality you need. However, Propeller’s single-tier subscription is always affordable. You don’t have to pay extra to access premium features and you can save by committing to a year of service. If you choose the right cloud CRM for your business, it will be easy to use and easy on your finances. With the centralized database hosted by a cloud CRM, employees from different departments all have access to the same customer data. Cloud CRMs allow everyone on your team to see the same information and share data securely. Each team member has their own login, so multiple reps can review the same file at the same time, which encourages open communication and collaboration. Not only does this foster better communication between marketing and sales, but it also helps you kick your customer service up a notch. By sharing up-to-date information with all team members, you’re able to provide prospects and clients with more consistent service and build stronger customer relationships. Cloud CRMs have the ability to keep up with your business as it grows and support your team expands. The flexible, agile nature of cloud-based systems make them perfect for businesses of any size, including startups looking for software that can scale with their budget, size, and goals. 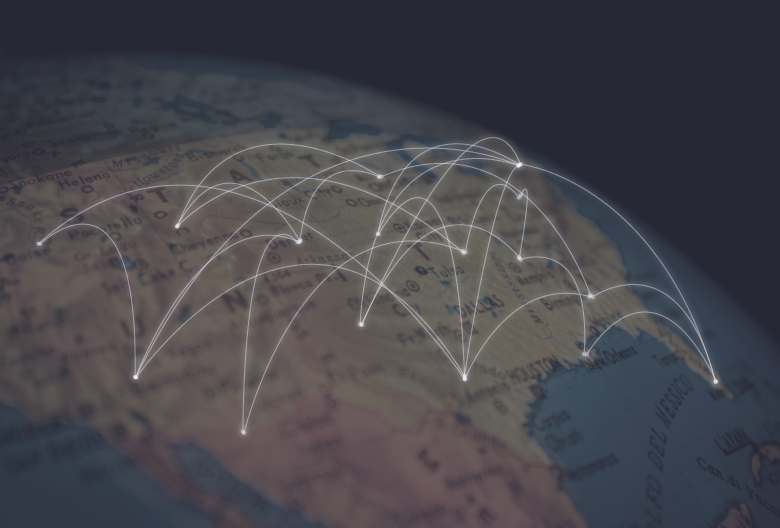 Because it’s easy to get more bandwidth and storage space without upgrading your system, cloud-based solutions are more flexible than those on a local server. This increased flexibility leads to greater productivity and efficiency across the board. The right cloud CRM can be easily integrated into your existing workflow. Which is great, because you don’t want to invest in software that doesn’t cooperate with the tools and services your team relies on to do their job well. 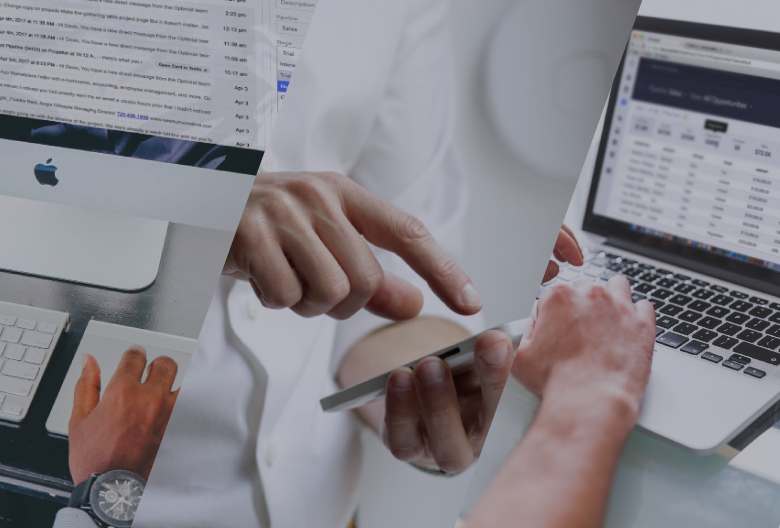 Just make sure you choose a platform that’s fully compatible with the services your sales reps already use – like your email client, for example. Compatibility is so important to a startup’s sales stack that we built Propeller specifically to help you sell within Gmail. 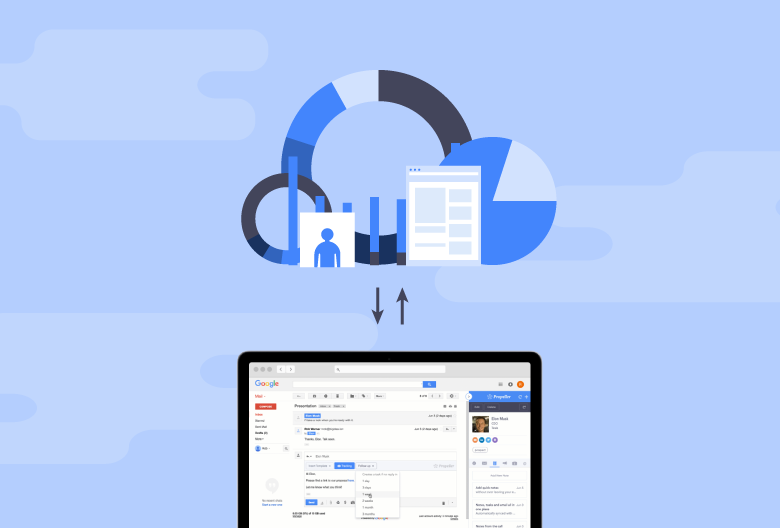 Our CRM integrates seamlessly with other apps you likely use day-to-day, including G Suite products like Google Drive, Google Docs, and Google Calendar. Cloud CRMs come with a built-in safety net for your data. Typically, without a cloud-based platform, backing up your data requires tons of resources and storage space – which can quickly inflate your costs. On the other hand, cloud CRMs provide a fast, easy way to recover your valuable customer data in the event of a system crash or power outage. Cloud computing is the way to go if you need a reliable, secure backup of your information. The heightened security of a cloud CRM protects your data and your business. As far as technology pet peeves go, there’s nothing worse than getting slowed down by running an old version of the software or getting interrupted by cumbersome system updates. Luckily, that’s not a concern for businesses that use a cloud CRM. Like any cloud-based app, a cloud CRM will automatically keep itself up-to-date, so you have one less thing to worry about. Once again, that means you don’t need anyone on your team to spend time manually setting up the system or performing routine maintenance – so you save money and time on IT resources. Not only does using a cloud CRM like Propeller enable you to build better customer relationships and provide better service to your clients, it allows your sales reps to close more deals and expand your revenue streams. Ready to experience the benefits of a cloud CRM for yourself? Start your free trial of Propeller CRM today.